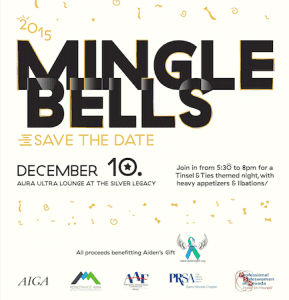 Join in from 5:30pm to 8:00pm for a Tinsel & Ties themed night, with heavy appetizers & libations at the Aura Ultra Lounge at the Silver Legacy. Have your cash money ready as we will have our annual raffle. Such prizes include: Hosted by: AAF, AIGA, PRSA, PSN & Reno AMA. All proceeds benefit Aiden’s Gift. Aiden’s Gift bridges the gap between insurance and families in the community. Their mission is to help local children with disabilities get the supplies and equipment they need that insurance does not cover.